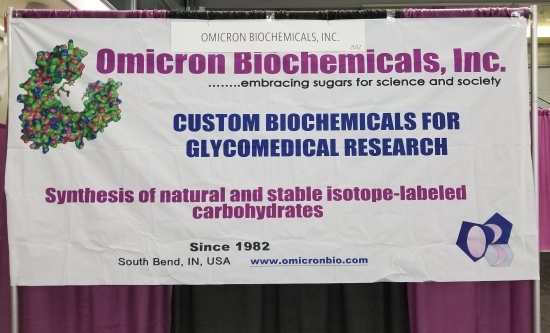 Omicron Biochemicals, Inc. @ ChemBuyersGuide.com, Inc.
Omicron Biochemicals, Inc. develops new and improved methods to introduce stable isotopes, primarily 13C, 2H, 15N and 17/18O, into monosaccharides, oligosaccharides (e.g., N- and O-glycans), nucleosides and nucleotides, sugar nucleotides, dolichol sugars, glycopeptides, and other saccharide derivatives. Omicron supplies > 900 labeled and unlabeled products, all prepared in-house, that are used, for example, as analytical standards in mass spectrometry, in NMR spectroscopy for structure determinations, in studies of enzyme substrate specificity, and as reagents in the development of medical diagnostics tests, vaccines, and therapeutics, with some applications requiring production under cGMP laboratory conditions. Custom synthesis is a key part of our business operation. Omicron has served the saccharide research community for > 35 years by providing high quality products at competitive prices and with reliable and timely delivery to promote scientific research and discovery worldwide.